The Tri-State Tollway takes Interstates 80/294 across the Hanson Aggregrates-Thorton Quarry between Illinois 1 (Halsted Street) and I-94/IL 394 (Bishop Ford Freeway). 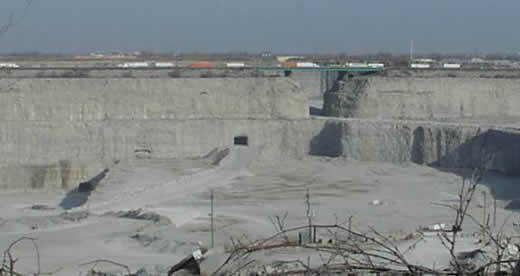 Extending across both sides of the highway, this pit is several square miles wide. A steel girder bridge spans a small portion of the quarry. Photo taken by Don Hargraves (2001). The Tri-State Tollway, Interstate 294 between Lansing and Deerfield, was designed initially as a bypass route around Chicago through suburban areas of Cook and DuPage Counties. However, I-294 became as important as any of the intercity expressways, as it connects the suburbs with O’Hare International Airport (ORD) and the rapidly expanded residential and business demands of the region. Avoiding much of the city, the Tri-State Tollway is a heavily traveled route with six to eight lanes for the majority of its length. The Tri-State Tollway, which carries Interstate 294 from Lansing northwest to Deerfield, was constructed starting in 1956 and was completed by 1958.2 This construction of the 83-mile Tri-State Tollway (and the other original tollways) was funded by a bond issuance in the amount of $415 million by the state tollway commission.4 All of the urban tollways (including the Tri-State Tollway, the Northwest Tollway, the easternmost portion of the East-West Tollway, and the Chicago Skyway) were open to traffic by 1958. Interstate 294 previously continue east from its present end at I-94/IL 394 into Northwest Indiana. The original Chicago Interstate system outlined Interstate 90 following the Calumet (Bishop Ford) expressway south to Interstate 80 (Kingery Expressway) near Lansing. Interstate 94 was planned to follow the Chicago Skyway and Indiana Toll Road through Gary. I-294 combined with I-80/90 east to Hobart and the Indiana Toll Road where I-94 and I-80/90 switched places. A grand renumbering took place in 1963, with I-90 relocated onto the Chicago Skyway and Indiana Toll Road, I-94 moved southward onto the Borman and Kingery Expressways, and north along the Calumet Expressway into Chicago, and I-294 retracted to the end of the Tri-State Tollway at IL 394/I-94. A $238 million expansion project widened the tollway to eight overall lanes. The expansion Interstate 294 from Illinois 394 north to the 163rd Street Toll Plaza was delayed several times; with an announcement by the Illinois State Toll Highway Authority on September 18, 2003, that completed was pushed back to 2005 (as compared to an original proposed construction date in late 2003 or early 2004). The Tri-State Tollway curves northeast from the IL 68 (Dundee Road) overpass one mile to Lake-Cook Road (Exit 52) and the merge with I-94 at the Edens Spur. Photo taken by Peter Johnson (06/25/16). Lake-Cook Road is a major east-west arterial that straddles the Lake and Cook County lines for 17 miles from Dear Park to Deerfield. Ramps connect with Lake-Cook Road from both I-94 and I-294, with each exit numbered based on their respective mileage. Photo taken by Peter Johnson (06/25/16). A two lane ramp (Exit 52) departs I-294 north for Lake-Cook Road while four lanes continue directly onto Interstate 94 west. A slip ramp beyond the wye interchange with I-94 provides access to nearby Deerfield Road (Exit 24). Photo taken by Peter Johnson (06/25/16). Interstate 294 concludes a 52-mile course through the greater Chicago metro area as I-94 westbound overtakes the Tri-State Tollway. The toll road extends another 24 miles north to the merge with I-41 & U.S. 41 north. Photo taken by Peter Johnson (06/25/16). Additional lanes were added to the Tri-State Tollway north at the merge with the Edens Spur in the early 2010s. Ramps for Lake-Cook Road and Deerfield Road were numbered 52 and 24 respectively by 2015. Photo taken by Steve Hanudel (05/14/06). Interstate 94 splits with the Tri-State Tollway in two miles and turns east along the tolled Edens Spur to U.S. 41. Photo taken by Don Hargraves (06/02). Continuing south, the Tri-State Tollway passes between Riverwoods and Deerfield to the Deerfield Road on-ramp. The succeeding ramps connect with both Lake Cook Road and the Edens Spur. Photo taken 09/02/05. Interstate 94 branches east with two lanes from the left as I-294 commences southwest with three lanes beyond the Lake Cook Road off-ramp. The tollway bypasses Chicago and is the best route for through traffic, especially during commuting hours. Photo taken 09/02/05. Interstate 94 crosses the Cook County line at the forthcoming Lake Cook Road overpass. I-294 straddles western reaches of the county to Chicago O’Hare International Airport (ORD) and Elmhurst while I-94 arcs around Northbrook south to Skokie and the Windy City. Photo taken 09/02/05. Progressing south through the unnumbered wye interchange at the separation of the Edens Spur from the Tri-State Tollway. Photo taken 09/02/05. Exiting the Edens Spur main line toll plaza, westbound Interstate 94 approaches Exit 24 for Deerfield Road and the wye interchange with the Tri-State Tollway mainline. Photo taken 06/13/15. Turning north below the ending I-294 northbound mainline, I-94 west partitions with the off-ramp (Exit 24) for Deerfield Road to the villages of Riverwoods and Deerfield. Photo taken 06/13/15. Exit 24 separates from I-94 west through a single lane tunnel with a 14 foot clearance below the Tri-State Tollway. Photo taken 06/13/15. Interstate 94 overtakes the Tri-State Tollway with two lanes as traffic from I-294 merges from the right. Photo taken 06/13/15. Interstates 80 and 294 combine along the southernmost section of the Tri-State Tollway. The toll road runs between the city of Harvey and the village of East Hazel Crest to Illinois 1 (Halsted Street). Photo taken 11/04/11. Advancing past the Hanson Aggregrates-Thorton Quarry west of Vincennes Road, the Tri-State Tollway approaches the systems interchange with the Bishop Ford Freeway: Interstate 94 to the north and Illinois 394 to the south. Photo taken 11/04/11. The Chicago Southland Lincoln Oasis precedes the unnumbered ramps for the Bishop Ford Freeway. The final service plaza on the Tri-State Tollway southbound offers food, gas and tourist information (Illinois and Chicago Southland Welcome Center). Photo taken 11/04/11. Two lanes separate from I-80/294 eastbound for Interstate 94 leading north to Chicago and Illinois 394 south to Crete and Danville. Photo taken 11/04/11. An end sign appears for I-294 below the high speed flyover connecting the Tri-State Tollway with Interstate 94 (Bishop Ford Freeway) north through South Holland, Dolton and south Chicago. Photo taken 11/04/11. The zero milepost for Interstate 294 is located in the median at the systems interchange with the Bishop Ford Freeway. The Tri-State Tollway ends and the Kingery Expressway begins here. Photo taken by Jeff Morrison (06/24/07). Prior to reconstruction, a cloverleaf interchange joined I-80/294 and the south end of the Tri-State Tollway with the Calumet Expressway (I-94 north / IL 394 south). Photo taken by Eric W. Vander Yacht (04/01). The previous end sign for I-294 preceded the loop ramp (Exit 160) from I-80/294 east to the inbound Calumet Expressway. Photo taken by Stephen Summers (12/00). Heading west on the Borman Expressway, I-80/94 & U.S. 6 split with U.S. 41 north at Calumet Avenue in Hammond. The freeway proceeds two miles west from Exit 1 to the systems interchange (Exit 160) with the Bishop Ford Freeway. Photo taken by Patrick Lilja (08/07/07). Crossing into Illinois, the Borman Expressway becomes the Kingery Expressway. A collector distributor roadway separates next for the continuation of I-94 north to Chicago and for IL 394 south to Crete and Danville. Photo taken by Patrick Lilja (08/07/07). Interstate 294 appears for the first time along I-80 west just ahead of the Exit 160 c/d roadway for the Bishop Ford Freeway. The massive reconstruction of the Kingery Expressway included the addition of the c/d roadway network extending east beyond Torrence Avenue (U.S. 6 / IL 83). Photo taken by Patrick Lilja (08/07/07). Interstate 94 west splits with I-80 along the three-lane c/d roadway. I-80 combines with I-294 along the eight-lane Tri-State Tollway beyond the adjacent SPUI (Exit 161) with Torrence Avenue. Photo taken by Patrick Lilja (08/07/07). The Kingery Expressway west at the original cloverleaf interchange (Exit 161) with U.S. 6 west and Illinois 83 (Torrence Avenue). Photo taken by Eric W. Vander Yacht (04/01). The single lane c/d roadway from Torrence Avenue added a fourth westbound lane for I-80/94 to their split at Exit 160B. Photo taken by Eric W. Vander Yacht (04/01). Interstate 80 west continued with just two lanes from the Kingery Expressway onto the Tri-State Tollway and I-294. Photo taken by Eric W. Vander Yacht (04/01). Westbound at the split of I-94 north to Chicago and I-80 west to Joliet. No advance signs referenced the adjacent loop ramp (Exit 160A) for IL 394 south to Crete. Photo taken by Chris Patriarca (05/25/03). During the “Kingery Expressway: On the Move to Improve” project, mainline traffic temporarily shifted onto the eventual c/d roadway for I-94 (Bishop Ford Freeway) west and IL 394 south. Photo taken by Steve Hanudel (05/14/06). Advancing west from the SPUI with Torrence Avenue along the c/d roadway toward the Tri-State Tollway and Bishop Ford Freeway during construction. Photo taken by Steve Hanudel (05/14/06). The c/d roadway partitions with a slip ramp to the Tri-State Tollway (I-294), the I-94 mainline movement north to Chicago and a flyover south to IL 394. Photo taken by Steve Hanudel (05/14/06). Illinois 394 (Bishop Ford Freeway) proceeds three miles north from the Glenwood Dyer Road interchange to the systems interchange with I-80/294 (Tri-State Tollway) west and I-80/94 (Kingery Expressway) east. Photo taken 09/03/05. Traveling through the Cook County Forest Preserve, two miles ahead of I-80, I-94 and I-294 at the Glenwood-Lansing Road overpass. Photo taken by Brian Dowd (06/02). One mile ahead of the cloverstack interchange with the Tri-State Tollway and Kingery Expressway on Illinois 394 (Calumet Expressway) north. The concrete pavement here was paved over with asphalt in 1990. Signs here were replaced by 2009. Photo taken by Brian Dowd (06/02). The north end of Illinois 394 was improved during the Kingery Expressway project. A third lane opens ahead of the Thornton Road overpass, with the roadway rebuilt using concrete. A new sign bridge posted to the south replaced this overhead assembly. Photo taken by Brian Dowd (06/02). Interstates 80 & 94 combine along the Kingery Expressway eastbound through Lansing and the Borman Expressway into Hammond, Indiana. The Illinois 394 north mainline transitions onto Interstate 94 westbound to Dolton and Chicago. Photo taken by Brian Dowd (06/02). A loop ramp joins I-80 west and the northbound beginning of Interstate 294 along the Tri-State Tollway. Photo taken by Brian Dowd (06/02). The initial sign for Interstates 80/294 and IL 394 appears along I-94 eastbound at the 154th Street overpass in the village of Dolton. Photo taken 05/09/10. U.S. 6 (159th Street) meets I-94 (Bishop Ford Freeway) at a full cloverleaf interchange (Exits 73A/B) one mile north of the Kingery Expressway. U.S. 6 turns south through Lansing to combine with I-80/94 via Torrence Avenue. Photo taken 05/09/10. Reconstruction of the Kingery Expressway also added a fourth southbound lane to the Bishop Ford Freeway leading to the separation with Illinois 394. Photo taken 05/09/10. The Interstate 94 mainline maintains two lanes as if branches southeast to merge with the Kingery Expressway (I-80) east to Hammond, Indiana. Illinois 394 begins and continues the Bishop Ford Freeway south to Crete via Exit 74A. Photo taken 05/09/10. Exit 74B follows from IL 394 south for Interstate 80 west to Joliet and the Tri-State Tollway north to the Chicago western suburbs. Photo taken 05/09/10. Approaching the East 170th Street overpass ahead of I-80/294 on Interstate 94 eastbound. Expansion of the Bishop Ford Freeway here included an additional lane and sound walls separating I-94 from parallel Prince Drive. Photo taken by Brian Dowd (11/02). Traffic separated for I-94 east to I-80 (Kingery Expressway) and the southbound beginning of IL 394 to I-80/294 west. The control city for IL 394 is Danville, located far south beyond the end of the state route at the cross raods of IL 1 and I-74 in downstate Illinois. Photo taken by Brian Dowd (06/02). Interstate 94 previously merged with the left side of Interstate 80 eastbound at the south end of the Tri-State Tollway. This connection was relocated to merge on the right, with a slip ramp linking to the SPUI at Torrence Avenue. Photo taken by Brian Dowd (11/02). “Tollway delays Tri-State widening until ’05.” Chicago Sun-Times, September 19, 2003. “South Tri-State Tollway (I-294) Rebuild & Widen.” – Illinois Tollway web site.